A mutilated body discovered in the woods. A murderous plan conceived in the past. When his attacker is found murdered the next day, Priest becomes a suspect and the only way to clear his name is to find out about the mysterious House of Mayfly - a secret society that people will kill for. June was a very poor month me reading wise I only managed one book. This month however I seem to have caught the reading bug again. Not only has my reading been more prolific this month but all the books, so far, have been outstanding. Mayfly continues that streak with aplomb. 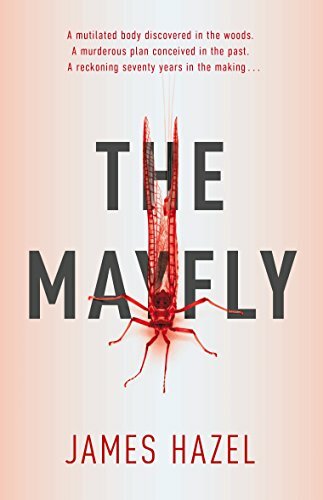 Mayfly is James Hazels first book a fact that I find hard to believe such is the quality of the writing, characterisation and storytelling. From the first page until the last I was totally absorbed by the story and the characters, in the Protagonist Charlie Priest we have a Flippant, Socially inept rouge with his heart in the right place and a character that can be as well known as Jack Reacher in the future. The story is told over 2 timelines , 1945 and present day it has obviously been well researched but at no time was it overkill or superfluous and unlike this review the ending wasn't a let down either. A fast paced, humorous, thrilling read that drags you in and wont let you go until the last page. Highly recommended.